South Korean Labor Minister Kim Dae-Hwan stressed that Seoul government will work hard to create hospitable business environment for investment from abroad. 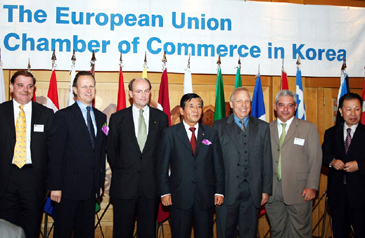 In a seminar hosted by EUCCK (European Union Chamber of Commerce in Korea) at Shilla Hotel on Oct. 6, 2005 the labor minister emphasized the South Korean government's willingness to induce foreign investment in his speech "Direction for Participatory Government's Labor Policy." The seminar drew over 100 CEOs and top business executives from EUCCK members companies and other dignitaries from foreign embassies. 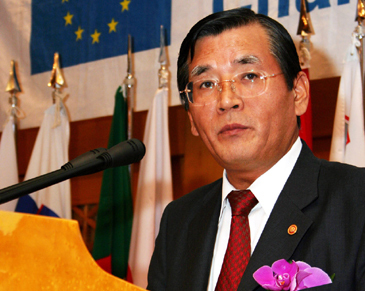 Among the VIP participants was EUCCK Vice President Philippe Broianigo, who also serves as president of Carrefour Korea. Another EUCCK Vice President Peter Thewlis, who is president of Burberry Korea. EUCCK President Frans Hampsink is expected to return to Seoul from his overseas travel. EU Ambassador Dorian Ford Prince and Dutch Ambassador Radinck J. Van Vollenhoven were included in scores of foreign envoys serving in Seoul. The following is the full text of Minister Kim. Expressing my gratitude to all of you, the representatives of European enterprises and ambassadors, presenting here despite your busy schedule, I would like to thank you for your efforts and contribution in promoting employment and investment in Korea through active business activities. I understand that you are experiencing various difficulties in the process of doing business in Korea where the system and the practices are different from yours. To address this problem, the Ministry of Labor is developing and implementing various polices to create a business-friendly environment. This is a good opportunity for me to talk about the directions and the contents of the government's labor policies to help you carry out stable business activities in Korea. As the global economy advances with the disappearance of economic borders, goods and capital together with information are flowing freely and the world is being reorganized into a single market. The acceleration of such external changes is increasing the importance of foreign investment in enhancing national competitiveness. Foreign investment promotes domestic investment and contributes to employment security through creation of new jobs. It also introduces managerial transparency and new organizational culture in Korea, and thus helps in establishing advanced social practices and systems in the country. Therefore, the Korean government is making great efforts to create a favorable environment for foreign-invested enterprises by designating economic free zones and easing various regulations, in order to induce increased foreign investment. The government has consistently pursued the advancement of the labor market and industrial relations as a key labor policy, with an aim to equally promote creation of business-friendly environment and enhancement of workers' rights. Successful establishment of the government's labor policies would not only benefit domestic enterprises and workers, but also improve investment environment for foreign-invested companies. 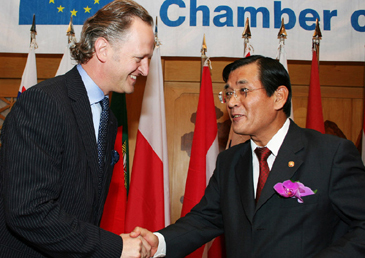 Labor Minister Kim Dae-Hwan (center) poses with EU Amb. Dorian Ford Prince (3rd frim right), Dutch Amb. Radinck J. Van Vollenhoven (3rd from left), and other VIPs. The government aims at establishing rational industrial relations to build the foundation for sustainable social development. It is pursuing labor policies to help industrial relations of our society to overcome the limitations of the 1987 and 1997 regimes and transform itself into a rational and advanced paradigm. I call this the "2007 paradigm." The government is also making efforts in terms of system and policies to improve the flexibility of the labor market so that businesses can flexibly respond to the changes of economic environment, while refraining from undermining the stability of the overall labor market. As you know, industrial relations is a mix of politics, economy and society, and it is a subsystem of the society as well. The Korean society has achieved significant development in industrialization and democratization during the course of modernization. However, social rationalization, a basis for industrialization and democratization, has been insufficient so far. There have been two important turning points in the history of the Korean industrial relations that affected its society as a whole. The first one is the 1987 regime. Labor movements started to act as one of the main driving forces of democratization through the protest of June followed by the Worker's Big Struggle of July and August. However, trade unions, as they gained more rights and power, started to become excessively political as they focused on claiming their "collective rights." The second one would be the 1997 regime, an industrial relations characteristics since the Asian financial crisis. To survive the financial crisis, businesses sought "managerial transparency" and "market efficiency." However, they have shown excessively uniform attitude as they attached importance to restructuring and financial gains or losses to overcome the crisis. Now labor, management and the government must establish rational industrial relations through efforts for changes and innovation. Labor and management need to break away from confrontations, provide a foundation for cooperation and respect individual characteristics rather than considering only their exclusive interests. The government is making active efforts for the "Advancement of Industrial Relations" and the "Advancement of the Labor Market" this year, and is seeking two major changes in this regard: first, reorganize industrial relations practices so that "Dialogue and Compromise" based on "Law and Principle" can be established, and second, provide better employment services while refraining from exhausting energy in industrial relations. 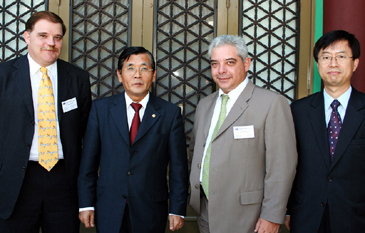 S. Korean Labor Minister Kim Dae-Hwan poses with Other VIPs. Let me talk first about industrial relations. For advancement of industrial relations, the government will not only reform the established mindset and practices, but also legislate relevant laws and systems. The government has been trying to establish rational industrial relations at workplaces as well as with umbrella unions, based on "Law and Principle." As the government has consistently maintained the position of voluntary bargaining between labor and management through CD (Compromise and Dialogue) within the framework of LP(Law and Principle) with regards to collective wage bargaining since last year, the number of "labor disputes" and "lost working days" have decreased significantly, showing a trend of stability at industrial fields. The government plans to consistently apply this principle also to umbrella unions, and reform irrational relations, formed on the basis of past practices and the expression of cordiality. The recent industrial conflicts, however, can be understood as transitional in the process of the transformation of the irrational relationship into a rational one. ※The public also questions the morality and democratic accountability of unions due to their successive scandals from the beginning of the year. The recent industrial relations issues at the national level are those that are caused in the process of the transformation of the irrational relationship into a rational one. 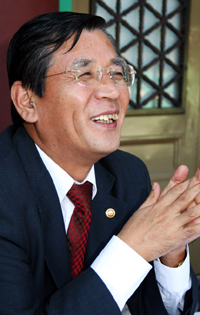 ※The unions' empty chair in the Tripartite Commission and the Labor Relations Commission and their announcement of nonattendance in the 14th Asian Regional Meeting, etc are some of the examples. "The Reform Measures for Advanced Industrial Relations Laws and Systems"(Roadmap) were brought up for discussions at the Tripartite Commission as the new government announced reform directions for industrial relations in September 2003. Although the discussions at the Commission have not been sufficient due to the absence of the KCTU, the government will continue to make efforts to create consensus among the academia and research groups. The government plans to prepare a bill that meets the international standards reflecting public opinions, and submit it to the National Assembly this year. Minister Kim Dae-Hwan shakes hands with a guest. Now let me move to the labor market policies. Job creation early this year was not quite successful in the beginning of 2005 because of the continued economic recession. ※ In the first quarter, both economic and employment growth marked the lowest at 2.7% and 0.6% (142,000 jobs) respectively since the financial crisis except for the economic slowdown during2003. However, the number of the newly employed started to grow rapidly since March and it increased three months in a row by 400,000 per month after May on a year-on-year comparison. The government is undertaking various employment measures including job creation, reduction of labor market polarization and employment of vulnerable groups. But one of the problems felt by many people is the issue of youth unemployment. As of August this year, the number of unemployed youth (aged 15-29) was 354,000 and the youth unemployment rate was 7.4%. This is a decrease by 16,000 persons and 0.2 percent respectively compared to August last year. The proportion of the unemployed youth out of total unemployment(843,000) is 42.0 percent, and the youth unemployment rate is 2.1 times higher than the overall unemployment rate of 3.6 percent. The recent changes in the labor market require active labor market policies. Changes such as economic structure, intensification of labor market polarization, imbalance in supply demand of manpower, ageing workforce are all important issues of the labor market policies today. To deal with these changes, the government is pushing through the Advancement of National Employment Services, innovation of vocational ability development and improvement of wage system on top of job creation policies. The government is fostering SMEs and venture companies and promoting competitiveness of the service industry to create new and advanced jobs that meet the employment structure of the future. Also, it is actively designing job creation policies such as job sharing and development of social service jobs. Through the Briefing on Innovation of National Employment Assistance Services in April 2005, the government is establishing specific plans for each program and is operating pioneer centers to promote employment assistance services as a national agenda. It has been providing customized information services since August 2005, and is seeking to establish employment assistance process that is tailored to individual characteristics in connection with employment insurance. It is trying to strengthen its partnership with universities and local governments by signing more employment assistance agreements with universities and holding job fairs jointly with the private sector and local governments. It plans to expand employment infrastructure and establish the Job World to provide improved employment assistance services. The government is trying to provide increased amount of training allowance for SMEs and support university curriculum within enterprises with a view to facilitating enterprises' investment in human resources development. It plans to increase support for workers' autonomous competency development by expanding the scope of workers eligible for receiving training allowances, easing requirements for recipients and launching a pilot run of the Learning Account System. In addition, it is studying the demand for training in the local labor market, developing training programs related to growth engine industries and operating human resources development councils by industries. To change the seniority-based wage system into the one based on duty and performance, the government has established Wage and Duty Innovation Center, and is seeking to develop and distribute an appropriate model such as the wage peak system. It is making efforts to expand the area of work where workers can be dispatched to and ease rigid regulations in employment such as prohibition of restrictions on dispatch of the elderly and employment period of fixed-term workers through implementation of the law on non-regular workers. ※The non-regular workers bill, which contains measures to make the labor market more flexible, reduce discrimination against non-regular workers and prevent overuse of these workers, is currently pending on the National Assembly. As the introduction of 40-hour workweek has been expanded to include workplaces with 300 to 1000 workers since July of this year, the government is providing guidance to workplaces to help them improve the leave system and maintain the wage level in accordance with the Labor Standards Act, and is trying to make working hours more flexible by promoting the use of flexible working hour system. The government has pursued labor policies that can meet the rapidly changing labor environment. It will make continuous efforts to help rational culture to be firmly rooted in various areas of the society by successfully promoting the advancement of labor market and industrial relations. Again, I would like to thank the European companies for contributing to employment creation and economic development of Korea by making much investments and building smooth industrial relations. I hope you will continue to make great investments in Korea. In addition, I would like to suggest you to provide internship opportunities to our youths in EU companies located in and outside Korea, and to increase annual hiring of Korean youths. The government will continue to make efforts to improve the difficulties in conducting business activities, and to create a favorable environment for foreign investors. Let me conclude by expressing my gratitude again to EUCCK for providing me with this precious opportunity. Thank you.